The intrepid Matt “Muahaha” Mazza, of the Santa Barbara Sentinal spent a few chilling hours in the Lobero Theatre last week in his own “Blair Witch Project” to bring us a spooky Halloween story. Read all about Matt’s experience in the full story below and here. The Lobero has stood on its current spot for 140 years, racking up thousands of live performances, hours of raw emotion in theatrical performances, energy spent in musical performance… seems like an ideal playground for spirits. “Theaters are places filled with lots of intensity, places that are full of meaning. The Lobero Theatre staff and stage crew make allowances for our, how shall I say, ‘bodily-challenged’ guests, by leaving a light on all night, every night – the Ghostlight. First, and most commonly encountered, is former stagehand and night watchmen, Harry Pideola. Harry passed away in the theatre, and continues to make his presence known to staff here alone after dark, stomping around or playing tricks. The other, Dr. Frank Fowler, a founding member of the Alcahema Theatre Group, has been known to turn up in the crowd or wings of the stage in his top hat and tails, eager to share in that curtain call. As we stand on the edge of the Lobero’s next 140 years, it’s fun to look back, and see what memories remain–some, more viscerally than others… I’m looking at you Harry. With our newest issue of Backstage at the Lobero landing in mailboxes, and digital distribution now complete, I wanted to follow up with a few personal notes about this special edition, as the editor. Starting from the cover — a striking image of the Gail Towbes Auditorium without any seats in it — to the personal stories of contractors, donors, and passionate friends who have made all this possible. The issue can be downloaded here, if you have, or create, an account. Enjoy it on your digital device, anytime. Don’t forget, the Lobero will re-open in December with new seats, bigger restrooms, heating and air conditioning, and improved access for all patrons as a part of Encore: Lobero. Learn more at LovetheLobero.com. There’s a new clothing company based off Cota Street in downtown Santa Barbara company with an innovative catalogue, Meet 32 Bar Blues, who produces quality apparel with casual styling. They also feature music by noted artists and clever tech pieces that folks who appreciate a Marshall amp will dig. Just before closing to begin Encore: Lobero preservation work in June, 32 Bar Blues came in to shoot their products for the fall catalogue throughout the Lobero theatre. 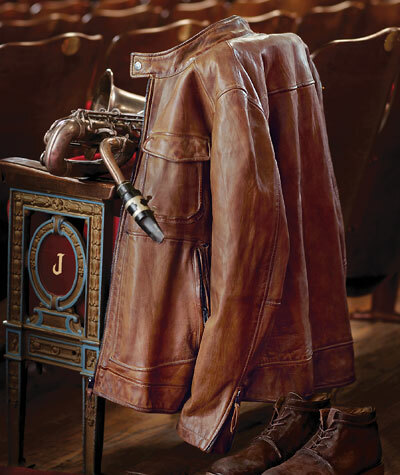 There’s great shots of supple leather jackets slung over seats, shoes tapping on guitar pedals, and sweaters hung in the dressing rooms. Fans of the theatre will have fun pointing out all the Lobero locations used in the instagram-styled book, and jazz and blues fans will enjoy the spliced insights from John Scofield and more. Live music fans should check out the Marshall ipod speaker and their selection of music available for sale by, wouldn’t you know it, a few Lobero LIVE alum. Best of all, proceeds on music and other arts pieces goes directly back to the artists. Visit LovetheLobero.com for more details about the campaign, and keep coming back for more fun photos and videos of our Preservation in Progress! Check out this time-lapse video of the Lobero seats being removed. The stage is now set for new floors, ductwork, restoration painting…so much exciting work going on! Keep checking back for updates and images of the preservation in progress!